Description: Townsite’s latest offering, this beer is described as an “accidental seasonal”, meaning that its creation was no-doubt serendipitous. Combining the tradition of Witbier with the addition of midnight wheat, we get a dark take on the Belgian wheat that is just in time for summer. Tasting Notes: I am a lover of dark wheats, but those have typically taken the form of Dunkelweizens. So it was both interesting and educational to try a dark wheat with a Belgian twist. In addition to being very smooth, clean and refreshing, it had a slight tang and a yeasty bite that could only come with Belgian yeasts and dark roasted malts. A good summer refresher! 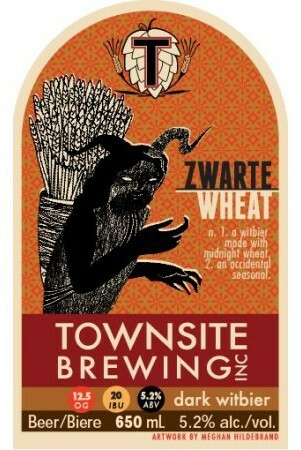 This entry was posted in BC Beer, Reviews and tagged BC beer, belgian-style beer, dark witbier, Townsite Brewing, Townsite Zwarte Wheat, wheat ale, witbier by storiesbywilliams. Bookmark the permalink.